Welcome car driving training. Today, I will teach you to drive car safely in heavy traffic. If there is big traffic on the road and you are feeling stress. 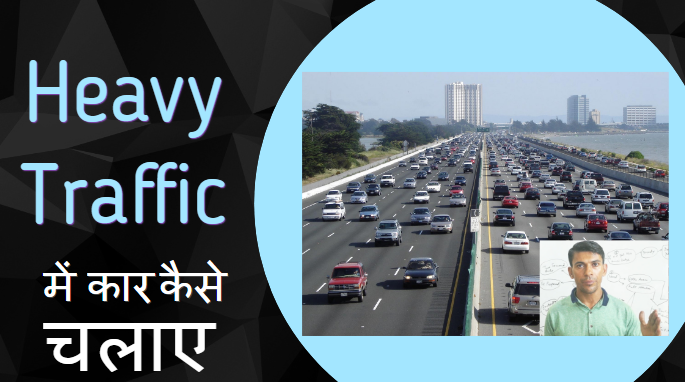 At that time, you should know how to cross this traffic and reach at your goal with your car. I have made its mind map. If you will memorize it, you can get benefit from it. You have gone to traffic without knowledge. You do not know to handle you and your car safely, your mind will bring anxiety. Which is a physiological disease and it will decrease your performance. You will start to think negative about future event. Due to this, you can face the accident. If same stress will be in your mind, you will reach late because your productivity of car driving will be zero. You may reach your goal in 3 hrs instead on hr. With this knowledge, my self confidence will increase. With this knowledge, my anxiety will remove. If I am here for driving car, my mind and body is here for driving car. c) I will ask to stop voice and try to keep silence in car. By seeing forward that traffic is big, you need to slow your car. You have to decrease your speed at 10 kms/ hr and give full attention on brake and clutch. You need to more car of safety. If I will be in your situation, I will follow following steps. 3. I will use my own signal and also watch the signal. 5. I will keep good distance with front car and other vehicles.